Naomi Klein’s The Shock Doctrine ties together history, economics, globalization, natural disasters and geopolitics into one bleak picture. Klein’s thesis is that the Shock Doctrine, also called Disaster Capitalism, has been put into practice all over the world, supported by Milton Freidman and his Chicago Boys. The shock doctrine is a theory that in order to put into practice the highly unpopular tenets of a free market economy, the implementation of such policies must happen directly after a shock to the national conscious. Such shock can take the form of a terrorist attack, national disaster or coup d’état. According to Klein, the population is so disoriented that they cannot adequately defend themselves against sudden drops in wages, high inflation and the privatization of social services like education and health care. While the disorientation of the masses allows policies to be implemented, it does not eradicate all opposition. In order to fully achieve that, the primary shock is coupled with a second, more literal one. Those who oppose free markets are abducted, tortured, killed or forced into exile. This is not, however, a project separate from the economic policies. Milton Friedman and his Chicago School Boys attempt to elevate their aims to a scientific level whenever possible in order to minimize the human element. Originally, the idea was that free markets and democratic politics go hand in hand, but as their experiments in Latin America unfolded, it became evident to them that an authoritarian regime was the only kind fully able to use the military might to enforce the kind of full-scale terror necessary to degrade the population to the point where it is incapable of protesting, where it has lost all connection to its culture and values. To the outside world, the poverty and disappearances are often invisible. Wealth is consolidated into the hands of the corporate elite. The country’s GDP grows, and an economic miracle is pronounced while health care becomes nonexistent and starvation and torture are rampant. Corporations are able to buy up previously nationalized markets at incredibly low prices. Trade unionists are detained and tortured throughout the country, and sometimes on-site at their own jobs. Even the corporate elite are not safe, as any who oppose the new regime can be dismiss, deported or worse. Finally, an essential point of Klein’s Shock Doctrine is the failures of free market economies. The economic policies implemented are typified by selling off national markets, like fuel, to the lowest bidder, as well as privatizing education, health care and the postal service. Inflation skyrockets, wages plummet and the people starve en masse. No one protests because they have been shocked into submission by a national disaster of some sort, just as their friends, family and neighbors have been literally shocked into submission. In order to demonstrate its thesis, the book asks and answers these five questions: What is corporatism? Where did the methods for these two types of shock come from? Was systematic state terror carried out in these case studies? Who was killed and why? Does free market economics work? The most horrifying question of this book is where did the methods for these two types of shock come from? The first section of the book is largely devoted to answering this question. First, she deals with the literal, torturous shock treatment. The method of using shock to erase the “diseased” parts of a human being’s personality so that they can be replaced with healthy portions was developed by the psychiatrist Dr. Ewan Cameron at McGill University in Montreal, Canada. He experimented on patients, funded by the CIA, in the hopes of finding a way to reprogram a human being. The CIA’s interest was in finding a way to deprogram Marxism out of human beings, in the hopes of reshaping them as capitalists. Dr. Cameron’s methods included all manner of sensory deprivation, from isolation to using hoods to block out light. People were put in small isolated chambers, and were served meals at bizarre times of the day in order to further disorient them. These findings were later indoctrinated into CIA handbooks for torture, which were used as a guide for the torture taking place in Latin America. This idea of psychological regression and reprogramming is interesting because the idea of shocking and rebuilding an economy ultimately stems from it. Several of the accounts from victims of the state-sponsored terror recall hearing the voices of gringos, or seeing white men in the interrogation rooms. They were often described as giving “pointers” and helping with the methods of torture. Additionally, these regimes were often taught by American CIA, and received funding from them. With regards to the methods of economic shock, the ideas are clearly from various Americans associated with the Chicago School of Economics. With Milton Friedman as their leader, he and his disciples pursued a policy of open, privatized markets with religious zeal. In order to spread these ideals and practice them on something other than mathematical models, The Ford Foundation and government funding helped send dozens of Latino scholars to Milton Friedman’s school. They then brought their economic ideals with them to Indonesia and Latin America. Unfortunately for them, the diplomatic process was not receptive to their ideals, as Latin America in the 1970s was very left-leaning. Its democratic process elected people like Salvador Allende, and its culture revered the likes of Pablo Neruda. Their economic policies marginalized in the open, democratic debate, it became clear that a more aggressive stance would be necessary. This is the point at which the two kinds of shock became inextricably linked. Just as the McGill patients had regressed into a confused, childlike state, unable to protect themselves, so would be any country who had experienced a similar trauma. And thus, the method was born. First, a shock to the country, which would confuse the population into a state where it would be incapable of preventing change. Economic reform like cutting state spending and selling off public goods was immediately taken into effect, as well as the second shock: torture. Any segments of the population that would not fit into the new order of individualistic, free-market capitalism would be disappeared, tortured, killed. This included trade union leaders, priests, nuns, activists, artists, musicians, writers, workers and peasants. The question concerning where the plan came from is important because we must find a way to stop if from continuing to be carried out. As Americans have largely been implicated in the book, it should be of utmost concern to Americans. It is our government, our foundations, our academics who have propelled such horror into existence. If we are to learn from the past and improve our future, we must understand the role we have played. We must correct it, not through revisionist history like Milton Friedman tried to, but by spreading the knowledge. As the short film adaptation made by Alfonso Cuarón and Naomi Klein emphasizes, knowledge is power, and it is the only way to put an end to the Shock Doctrine. Klein’s thesis is a thorough examination of a cold-hearted, skillful implementation of free market economics. Her thesis is enlightening in that she illuminates the connections the CIA, the Ford Foundations, MNCs and the University Of Chicago School Of Economics have to these shocks worldwide. The author is clear in showing that it was not merely good economic advisors who happened to work for men who violated human rights. Rather, she shows the violations as a means to the economic policies, not an end. Prior to reading this book, I had learned about Shock Treatment as a method of helping an underdeveloped country become developed, along with Foreign Direct Investment, Structural Adjustment, Export-Oriented Industrialization and Import Substitution Industrialization. I had also been taught about the bloody regimes of dictators, the torture in Abu Ghraib and the corporate mercenaries in Iraq. Never before, however, had they been taught together, as policies intrinsically connected to one another. In fact, the names of the countries’ leaders were never mentioned when discussing methods of economic stimulation. A major success of this book is the format used to prove its theory. After outlining the fundamental theory, the complex origins of the phenomenon are described. The rest of the book is used to show several in-depth case studies from the past half-decade, from all over the world. A broad variety of shocks are shown, from military coup to natural disaster. As the case studies progress through time, there is also a clear link to Milton Friedman and his disciples, as well as various American institutions. A common criticism of this book is that it vilifies Milton Friedman. I agree, Friedman is vilified, but I do not criticize Klein for it. It is clear from the evidence here that he was in contact with many world leaders throughout his life. They valued his opinion, he visited their countries, and he sent them his protégés. It seems laughable to acknowledge Friedman as an intelligent man and at the same time claim he cannot be held responsible. There is more than one way to kill a man, and Freidman and his Chicago Boys helped find many. They may not have tortured with electric shock, but lowering wages and causing the price of bread to skyrocket will just as surely torment and kill the population. After reading this book, it has come up in other classes and I have discussed it with many students and teachers. A common experience is that it seems to explain so much about what is going on in the world right now. One has a better understanding of American politics, both foreign and domestic. This also illuminates the truth of its case studies, and leaves the reader with an odd feeling. That is, many educated people are aware of the various factors: economic “development,” the human rights abuses, the disasters that took place, electroshock treatment, torture and US interference. However, no one has ever pulled all the evidence together in this way, and thus drawn these conclusions. Having completed the book, it seems strange that Klein’s connection was never made before. 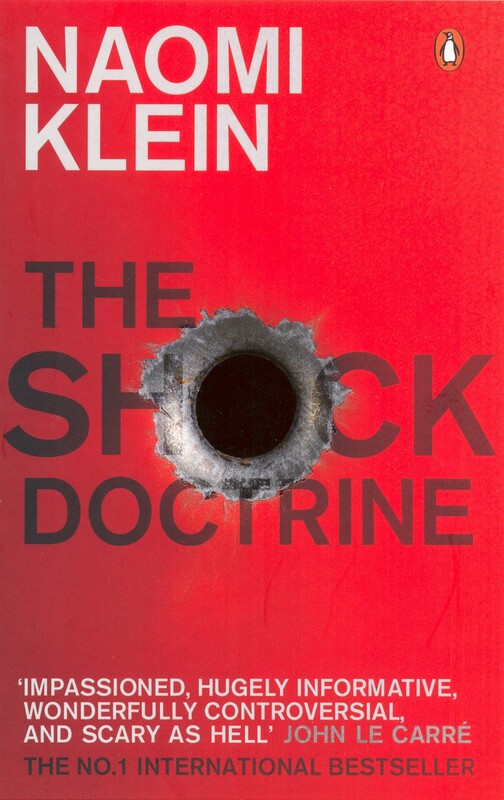 In conclusion, Klein’s Shock Doctrine should be required reading. It shows a side of capitalism that we like to ignore: inflation, wage hikes, kickbacks, corporatism, and violence. Capitalism is not inherently evil, but it is also not an innocent, pure science, to be revered like religion. Friedman’s crucial error was to ignore the human element as negligible, and it is anything but. It is because of the human element that free market capitalism is not worthwhile, and due to that same human element that it cannot coexist with democracy. Reading Klein’s work allows us all to feel like one of Dr. Cameron’s patients for a little while. Suddenly, we understand why our world has been so strange: we have unknowingly been the subject of experiments, and those experiments have failed. Delia M. Harrington graduated in 2012 with a concentration in International Affairs from Northeastern University in Boston, MA.